My wife and I consulted a well-known Geomancer for our present home. We were instructed to place a piggy bank at the wealth sector and to put some money into it everyday. It's like your wealth is growing everyday. We were told not to place any moving objects such as clock, electrical appliances, plants etc..... anything that is "live" near the wealth sector. These things will "disturb" the wealth. One thing in particular was not encourage was the rearing of fishes. You will be throwing away a lot of water "your wealth" when you do water changing of your tanks. But, I've heard many stories of hotels and Companies who were not doing well put waterfalls, fishes and fountains after being advised by their engaged Geomancer. It is kind of strange these businesses flourished after they did what was being told. The waterfalls and fountains movement are even greater and the water changes are far much more yet the results are very positive. If one geomancer discourage movements and water yet another does exactly the opposite, but both with some logic. How can we know which one suit us better? Incidentally, can we rear fishes at the wealth sector? Please enlighten, thank you. 1.1 Most likely the well-known Geomancer you mentioned specifically or chiefly uses only the Shapes and Forms school of Feng Shui. And symbolism plays a significant part in this school i.e. the use of piggy bank to create a nice feeling of wealth and the throwing away water is like throwing away `wealth? 1.2 Most probably, this well-known practitioner did not use or combine it with the Flying Star Compass School of Feng Shui which is based on a mathematics formula to detect locations that are favourable for a water position. 1.3 The rationale is because all of us are either inclined to being right or left handed. Some of us feel more comfortable and easily relate to Shapes and Forms. While others are more mathematical. For example, for a person who is more inclined towards mathematics; may not imagine or see a `dragon feature?at a specific location. But instead if we relate a sector or location with a mathematical number, he/she could thus see it in numerology form. 1.4 In the US, top students who are more inclined towards humanities studies e.g. human resource, organization behaviour etc?usually study at Harvard University. While those who are more inclined towards mathematics e.g. economics, nuclear science, physics go to University of California. 1.5 What Flying Star Feng Shui (mathematical side of Feng Shui) does is that it helps a Geomancer analyze each sector or `wealth sector?to determine the type of wealth enhancement that can be used for a specific sector. Thus, if a sector is good for a fountain or waterfall, then such features can be placed at that location. 1.6 For example, , under Flying Star, locations where metal elements have been detected, water can be used to enhance such "metal locations". Thus a combination of water with metal can help to enhance beneficial Qi for the building and occupants. 1.7 Therefore, usually a Geomancer should take into account both Shapes and Forms as well as Flying Star Feng Shui in order to a well balanced analysis. But some does not put into use both schools of Feng Shui. And most likely, have a `bias?for only one type of Feng Shui school. It is strongly recommended that Geomancers put to use both schools of Feng Shui. Hi Master Cecil, It is nice to be able to have guest speaker. Happy to know that this time the Live Chat will be on Feng Shui. Thanks to the club for bring us this opportunity. Anyway, here goes my questions. I recently bought a red arowana at one of the lfs and it is 6 inches close to 7 inches now. However 1 week after bringing it back home, my arowana keep jumping and in the process lost a few scales and even spilt the tail. I have an adult Pahang Gold and during its younger days do not display such a character. Consulted a friend who advise me to place $8 inside the red packet and place it above the tank. Mine happen to be glass tank but surprisingly it stop jumping till this day. I know this is funny but I do hope that you will shed some lights on my concern. What will happen if I were to remove the red packet. 2.1 The core of Chinese sciences of the Universe: Feng Shui, the Chinese Astrology and various other Divinity methods revolves around the understanding of the importance of the Five Elements. These elements are Water, Wood, Fire, Earth and Metal and are considered the building blocks of life. 2.2 According to ancient Chinese, these Five Elements are interactive, shape and stimulate our daily life. 2.3 Under the productive cycle of Feng Shui, Water nourish plants and trees: producing Wood, Wood makes Fire which burnt into ashes to form Earth, Earth is the source of Metal. Metal can be condensed to water or can be melted into liquid i.e. `Water'. 2.4 Feng Shui utilizes the Five elements concept, also. 2.5 For example, assuming a specific house is at the ground floor and from the living room window, one can see a lamp post slicing through the window. Under Feng Shui, this is considered as a threat for the owners of the house and need to be neutralized. 2.6 Since the lamp post is tall and thin; even if it is made of metal or wood, it is still considered as a `tree?which is considered as the WOOD element. 1. EARTH element: This is represented by a rectangular fish tank and pebbles in the tank. 2.9 But often the fire element may not be enough to create a full balance. Since red colour represents the fire element, a simple solution like a red packet can help to increase the fire element to create a balance. 1. EARTH element: This is represented by water flowing down to the centre-point or to the earth. 2. METAL element: The bronze ring is made of metal. And also circle represents the metal element. 3. WATER element: The actual water flowing down from the ring. 4. FIRE element: The laser light display. 2.11 In the above illustration, Metal element is represented by a round ball. Water element is represented by real water flowing under the ball (rotating it). Plants can be added e.g. a potted plant next to this fountain. 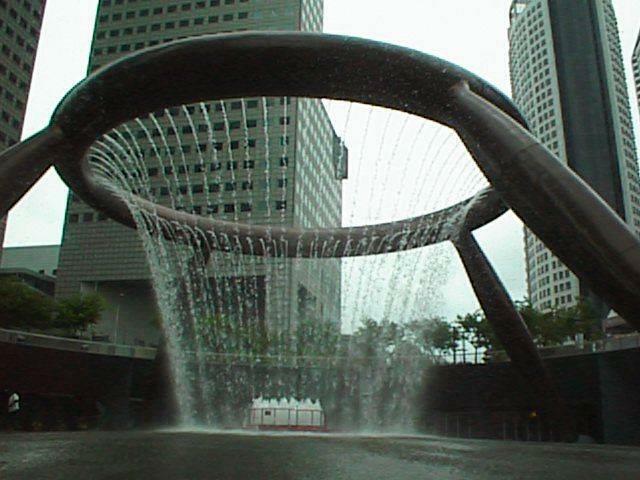 Earth element is represented by the material of the fountain e.g. granite. 2.12 Due to the time dimensions of Feng Shui, it is most likely that the current location of your fish tank has an imbalance of or lacking the fire element to harmonize that sector. Without further analysis to determine correctly this sector, it is difficult to say for sure if removing the red packet may cause any problems. The adage: ?If it is not broken, don't fix it is true ? 3.1 Why is it better to paste a red packet?? - This is based on the above explanation. 3.2 Which part of the Tank should we paste it?? - So long as the location can be seen is OK.
3.3 How much should we put inside?? - Any symbolic amount will do. Usually an even number / amount. $2 or $8 is ok.
3.4 Or izzit depends on our eight char??? - Yes, some Geomancers base it on one's Gua number. - For example, if one's Gua is South (Li) then place $9. And if one's Gua is North (Kan) then place $1/- or East (Chen) then $3/-. In my opinion, it does not matter. 3.5 Where's the best place in our house for fish tank??? - Usually in a professional Feng Shui audit: Shapes and Forms & Flying Star. - Under Shapes and Forms Feng Shui: it is placed along a wall and in most homes such as the living room area. If it is a fountain, then it is acceptable to be placed at the balcony. - Under professional Flying Star Feng Shui, priority is usually given, first to Shapes and Forms Feng Shui. And if a specific location in the living room has been detected to have METAL elements, this location, this is considered as the wealth sector for a water position. - It is by the combination of both Shapes and Forms and Flying Star Feng Shui that we can fully take advantage of specific locations that can encourage `wealth?building. - Alternatively, try to employ all Five elements in a Fish tank to harmonize it to the surroundings. 4.1 It is best to avoid a water feature for an individual with `weak fire?or `strong water?element. It does not matter if it is a water fountain or a fish tank with any time of fish e.g. dragon fish or gold fish, koi etc? 4.2 Water can further extinguish a `weak fire?element person.. While a person with `strong water?element may be `drowned?with too much water. 4.3 It is best to accurately determine your true ba zi element and strength. For example, there is a difference between WEAK or STRONG wood element. Furthermore, your true element may not be necessarily wood-tiger element. In a full or accurate ba zi analysis; the Year, Month, Day, Hour, House of life and House of conception pillars are looked at to determine exactly one's birth chart. 4.4 In general, fire element is good for strong wood element person. But unfavourable for a weak wood person. Therefore, it is best to determine whether you are actually weak or strong. This question is similar to the reply given in Question 6, thanks. 6.1 If I keep my tanks and my room neat, is it ok for my tanks to remain in my room? 6.2 If not, what is the best location to place in the living room? Examples are facing the window, etc. 6.3 Any steps to take to enhance the Feng Shui of my house with my fish tanks? 6.1 Under this link: https://www.geomancy.net/poll/poll.pl one can find several polls relating to television sets in the bedroom. One of the polls is: If you do not cover the TV sets, do you have sleep problems? 6.2 In my opinion, it boils down to our tolerance level. For example, some of us can eat lots of hot chilli-padi. While others have very low tolerance. 6.3 It is similar to your situation. If you can sleep soundly with all the sound of the pumps most of the time, then, there is really no issue on this given your current constraints. 6.4 Frankly, we are on this earth for a relatively short period and we should make most of it. 6.5 Imagine, from young, if your room has a TV set. And in your own privacy of your room, you truly enjoy the entertainment. But do we have to listen to a geomancer or a family member who had consulted a geomancer that a TV set is a no no? What would be our life like afterwards? If the argument is that the screen of a TV set is like a mirror. But think again, many of the screens are tinted and some of the latest screens are plasma or LCD screens with little reflection. As a *joke*, some say that when we sleep, our spirit may be shocked to see itself in the mirror. But it could be the reverse! The spirit may like to look at itself before living the body! 6.6 Feng Shui should not become too much of a taboo. 6.7 Many of the concepts of Feng Shui has to do with commonsense. As mentioned in an earlier reply, best locations are usually in the living room location or through the use of Flying Star Feng Shui. Hi Master Cecil, My impression of the study of Feng Shui is that it deals with the Five elements and the movement of the various Stars and planets and their influence on the flow of Qi. Therefore, in regards to Arowana keeping , can we can that it has got nothing much to do with what kind of fish we keep. Rather, the important thing is the placement of the fish tank (element of water) , followed by the 'health' of the water in the tank ? Further to this , can we say that , the species (colour) of the Arowana is not really important ? One more thing , it is said that , one can't have fish tank in the bedroom , due to .. 'turbulence' . As I can't really shift my tanks rite now , it will take me at least 6 months to move all my 6 tanks out of my room. Is there any method to counter this .. 'turbulence' caused by the water element in my bedroom ? Thank You. 7.1 Frankly, in Feng Shui, there is really no issue on the type of fish kept. It can be fresh water tank: koi, dragon fish, goldfish, salt water tank. 7.2 In general arowana fish because it is shiny/silvery already belongs to the METAL element. Gold arowana simply is an extension of the metal element while a red arowana has metal and fire element. As the fire element is minimal as compared to the entire fish tank, it does not really have a major impact on the elements within the fish tank. Hi Master Cecil, I'm in TW, nice to meet you here. I'm not familiar with the Feng Shui thing for the arowana. I have few beginner's questions. Thanks in advance for the explanation. 8.1 People here say that red arowanas are for business and should be put in office, while golden arowanas (rtg or xback) are for luck and safety and should be put in home. Is that true? -This has more to do with our personal beliefs than Feng Shui. Most likely, some people may believe that the `fire?element of the fish may perhaps `burn-away?their luck. 8.2 I heard odd numbers of arowanas is better than even numbers of arowanas. Is that true? What about the number of the tank mates? Also, what about the total number of fishes in the tank or in house? - This has to do with the Yin and Yang concept. - To balance the water (yin) in the fish tank, one concept is to go for odd number fishes. As odd numbers represent Yang. Thus; this is to seek a balance of both yin and yang. - As a fish tank usually holds one lone dragon fish, there is thus a balance of yin and yang. (Although, this is a coincidence since dragon fishes are territorial and go well with it). In geomancy, is there a preferred number of fishes that we can keep? E.g. keep odd number of fish or even number of fish? What is e rationale? does e number of fishes refer to the total number of fishes in the tank or just e number of fishes belonging to a specific breed? The most common method is based on general good numbers of fish i.e. fishes. Either odd numbers or nice sounding e.g. 8 for `luck?or 9 for longevity. 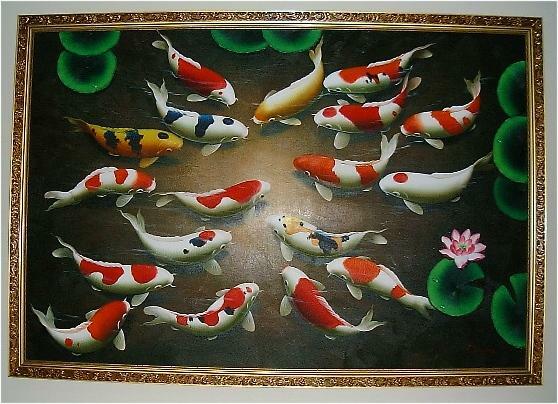 Very often, famous koi paintings usually have 9 fishes or 8 fishes. In this painting, one can see 9 fishes x 2 (total of 18 fishes) meeting each other. This is symbolic of longevity x 2 i.e. 9, 9. The other method is based on your Gua number i.e.. if your Gua is Li or South, one should rear 9 fishes. If your Gua number is Kan (North), you should rear 1 fish, if your Gua number is Chen or East, then you should rear 3 fishes. Ideally, this is based on the breadwinner's Gua number. 9.2 Frankly, so far, there is no right or wrong answers. Many of the methods are highly subjective and subject to various interpretations and even confusion. For example, if one is rearing arowana in a small apartment; it may not be possible to rear say 5 or more arowana fishes. As, I believe, each fish needs its own `space?or tank. 9.3 If one rears salt water fishes or small fishes it is very impractical to often count how many are left. But rather, majority of the fishes are of the metal element which is one of the most neutral elements in Feng Shui. Hi, I was told that it is not very good to put fish tanks which contains "dragons" and "tigers" facing the windows or the entrance of the doors. While this can frightened off bad luck, I was told good luck will also be " frightened" away. 10.2 In general, it is advisable to avoid having a water position at the West or tiger location especially a pond or swimming pool. The belief here is that a water position is symbolic of a tiger's open (hungry) mouth. Symbolically; a tiger with an open mouth is considered inauspicious as this implies it is always hungry and trying to devouring/swallowing everything around it creating problems for the owners/tenant. 11.1 What kind of person is best suited to keep such setting?? 11.2 Do you recommend such setting?? 11.3 What will happen if a person not suited for such setting were to keep one?? 11.1 In general, the dragon's element is Earth element. 11.2 And under Flying Star Feng Shui, the two most dreaded inauspicious stars are #5 = misfortune and sickness and #2 which is sickness element. Both #5 and #2 are known as bad earth elements. Flying Star Feng Shui uses time dimensions. For example for a house that was born, built or had a major renovation done between 1983 to 2004; this type of house is known as a Period 7 house. And in general, compass directions East has a base #5 and the year chart also has #5. And South has a base #2 and the year chart also has #2. Too many dragons i.e. 9 x earth elements may pose too much an imbalance for such a sector. (This is just a preliminary analysis only as there are a total of 24 permutations for any home within the Period 7 and the charts may differ accordingly to the facing of each house). 11.4 In the above example, one can notice that too much an element at a sector especially if these are bad star numbers is bad. It is like eating food i.e. we would be sick of a particular food if say we have to eat chicken rice for lunch, dinner and for the next two weeks or more. 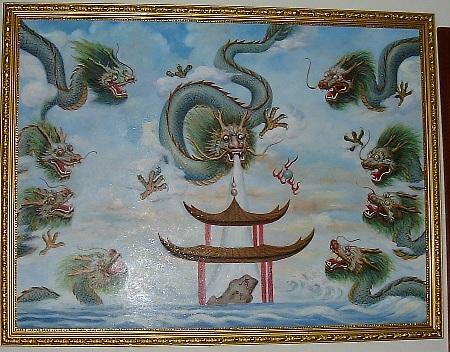 This painting is interesting because it has nine dragons. It was commissioned for me facing a long corridor overlooking a lone lamp post. If one notice carefully, the author dare not sign his name on it for fear of inauspicious sha qi befall onto himself. Hi Master Cecil, I am born in the year of water OX, what type of arowana is suitable for me?? Where should I place my tank in my house??? 12.1 Please refer to the reply to Question 4. It is best to avoid a water feature for an individual with `weak fire?or `strong water?element. It does not matter if it is a water fountain or a fish tank with any time of fish e.g. dragon fish or gold fish, koi etc? 12.2 Water can further extinguish a `weak fire?element person.. While a person with `strong water?element may be `drowned?with too much water. 12.3 It is best to accurately determine your true ba zi element and strength. For example, there is a difference between WEAK or STRONG wood element. Furthermore, your true element may not be necessarily wood-tiger element. In a full or accurate ba zi analysis; the Year, Month, Day, Hour, House of life and House of conception pillars are looked at to determine exactly one's birth chart. A. I am wondering whether is it okay to have tanks and arowanas in a room? I have 7 tanks in one room. If not, what is the reason why? Obviously, you are more of a hobbyist; looking at the number of fish tanks that you own. By coincidence, from my past experience, many of us who take up a hobby usually do it out of pleasure rather than having a `motive'. From my opinion, perhaps, it is your affinity with or `tranquility' with fishes that keeps you going. And I do not often see any problems or issues relating to Feng Shui on this count. But rather, often or rather, I do hear of problems especially for those who purchase or own a fish tank not so much out of `pleasure' of rearing fish but because, they were TOLD to do so. B. By Feng Shui, is there any rules on which what kind of fish should be with each other and what is not suitable? Here is my below fish, are they suitable to be put in such a way? Hi Master, I heard people are saying that fish tank with more red colour object like stickers, etc is better for Feng Shui....izzit true??? What if my tank is all black colour??? What should I do??? It is best to understand the Five Elements concept. Please refer to the reply under Question 2 (above). Black belongs already belongs to the water element. So long as your fish tank is earth shaped e.g. rectangle, there is not much an issue here. Hello Master, Is it true that we should keep red dragon at home, gold dragon is for business, and why? Thank you. Please refer to the reply Question 4 and 7, thanks. Dear Master, we often hear that people use Feng Shui to enhance some aspect of their lives such as overall family wellbeing, education or career. Has anyone use Feng Shui to counter the effects of evil spirits? Not that I believe in the existence of evil spirits but in your experience, has Feng Shui being used in terms of an arowana to ward off evil? Hope you could let us know as quite a number of arowana web sited stated that arowana could be used as to ward off evil spirits. Thank you Master Cecil Lee. 16.1 Please refer to the reply under Question 2. Hong Kong Geomancers favour using fish tank to neutralize imbalances. For example, a specific house that is at the ground floor and from the living room window with a lone lamp post slicing through the window. Under Feng Shui, this is considered as a threat for the owners of the house and need to be neutralized. And a fish tank (often with gold fish is used) here. 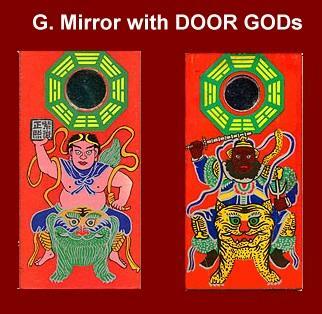 16.2 For Feng Shui practitioners who may be religious inclined may perhaps, ask their clients to place a ba gua mirror or a ba gua mirror with door gods on it; or even a yellow charm to ward-off evil. But in my opinion, if there is an existence of a ghost, logically, it is difficult to imagine how can a ghost be scared of a fish. Be it a dragon fish or any other fish. Good day si fu Cecil. I am very interested in the application of Feng Shui in my home. in about a year time i will be getting my own flat and I intend to bring my goldfishes and get a new red arowana as my pets. goldfishes in pond and arowana in tank. in view of these I would like to find out more about Feng Shui and fish keeping. about myself: my Gua number is 6. I am born in the year of the fire dragon. 17.1 Can I keep these fishes? 17.2 Where should I place them? 17.3 How many of them can I keep? 17.2 Even if one is weak fire element or strong fire element, it is still possible to rear fishes. This is by introducing all Five elements to a fish tank or keeping the water positions outside of the house e.g. balcony or if it is a landed property, based on Shapes and Forms Feng Shui. If Flying Star Feng Shui is used, one can further use it to `detect' locations that can bring harmony or even enhance beneficial qi to a house. 17.4.Is there a guide to the measurement of the tanks? This is often not an issue especially if the fish tank is rectangular in shape. Avoid using a pyramid shaped fish tank as it is considered inauspicious. 17.5.How will these affect my wife and kid? Thank you. Where possible, it is best to avoid placing the fish tank exactly at the centre-point of the house as often, this may affect the health of the spouse. Wishing everyone, Health, Wealth and Happiness! Feel free to post any more new questions during our chat session; this evening (Wednesday, 4 December 2003) at 8.00pm.